In Greek mythology, Dionysos was the son of Zeus and Semele. Dionysos, one of the most widely worshiped gods of Greek mythology was considered a patron of the arts. 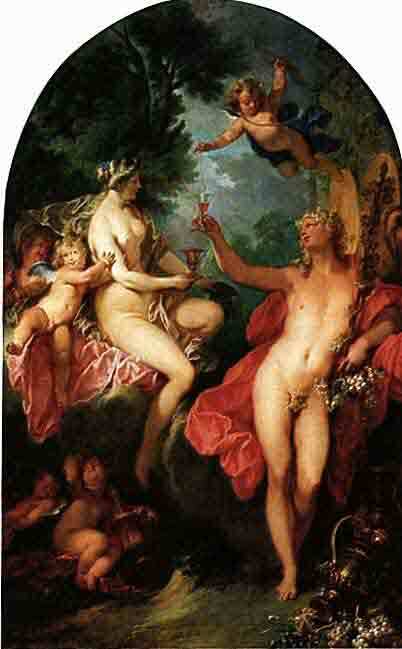 Dionysos was the god of fertility and wine. Later he became the god of vegetation. Still later he was the god of pleasures and of civilization. 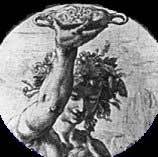 In his early years the young god Dionysos learned to make wine and journeyed across the world to give it to the mortals. Dionysos was represented in works of art as a beautiful youth, crowned with vine leaves or ivy. His festivals were celebrated with processions, dances, and choruses, out of which grew the Greek drama and the Greek theatre. The ancient inhabitants of Athens, during the 4th Century BC in their wisdom, built a Sanctuary to Dionysos on a hillside in an area known as Ikaria in the then remote pine-scented forests covering the lower slopes of Pendeli mountain, about 30 Km from the centre of Athens. The Sanctuary now falls within the northern suburb of Athens now named Dionysos and is still surrounded by pine trees. The Sanctuary, which had been neglected for countless centuries, with stone blocks scattered everywhere & nothing left standing has been undergoing a major & detailed archaeological reconstruction program (starting 2001) and we await it's completion with anticipation as a special place to visit. One can only speculate on some of the wild, outrageous ceremonies and events that must have taken place at the Sanctuary in ancient times. Directions: From the main road northwards through Ekali (suburb of northern Athens) take the road on the right to Dionysos (signposted for Nea Makri), and continue on up Pendeli mountain until you pass the Dionysos Taverna on your left. The next road on the left takes you to the Sanctuary - which is on the left, behind a fence at a right-hand bend in the road. If you reach a Convent on your right you have gone too far. You can also follow the 536 bus route (see more details below). If you are coming over the mountain from Nea Makri or Melissia/Halandri, on arriving at the Panorama restaurant junction, travel on down the mountain road towards Dionysos, passing the turnoff for the German cemetery on your right. Exactly 2.5 Km further down from here turn right into the road signposted for Rapentosa Village. Directly below this sign is a sign for the St. Pantelemonos Monastery (actually a Convent). These two signs, written in Greek are fixed to a tree and are rather small (and may get removed at some point in time). The Sanctuary is a few hundred metres down the road, on a bend, on the left. There is a small gate in a wire fence & you can easily miss it. The 536 bus from Kifissia to Dionysos terminates a little further down this road, very near the Convent. STOP PRESS (2004): A proper sign for the Sanctuary has now been placed on the main road. Cadmos, the founder (and first king) of the city of Thebes (located North of Athens) had four daughters by his wife Armonia who was the daughter of Aris (i.e. Mercury) & Aphrodite (i.e. Venus). One of the daughters was called Semele. Zeus (also known as Dias), the head of the gods took a fancy to Semele and divinely impregnated her. Zeus's wife Hera became jealous and taking on the appearance of the palace nanny appeared before Semele suggesting she ask Zeus to visit her. He did so, unfortunately accompanied by his thunder and lightning. Semele became so scared that she gave premature birth to the baby Dionysos, and then died. Zeus ordered Dimitra (Goddess of the Earth) to wrap the baby up in ivy leaves so that the fire in the Palace caused by his lightning would not harm him. Zeus then took the baby and sewed it into his thigh with golden thread so that it could come to term. Dionysos was then born for the second time from Zeus's thigh. Hera was not satisfied with Semele's death. She turned her revenge to the new-born Dionysos and turned the king of Orhomenos & his wife insane, to whom Zeus had entrusted the baby. Zeus then ordered Mercury to transport the baby to the mountain of Nysa and entrust him to the mountain Nymphs to raise. There in a cave with a roof hung with grapevines Dionysos spent his childhood. One day when the grapes had matured, he squeezed and tasted the sweet juice. Finding it good, he gave grape juice to the Nymphs, Shepherds and Demons of the forest. They became enthusiastic, their hearts lightened, and their sorrows were forgotten. They ran to the top of the mountains and down to the plains with much noise and joyful laughter. 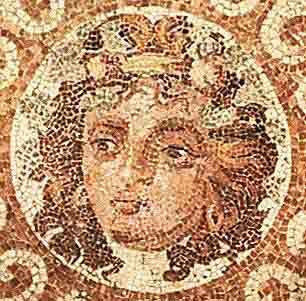 When he grew up, Dionysos left Nysa wearing wreaths of vine leaves and ivy leaves. He travelled the world promoting the cultivation of the grapevine and the new cult, of which he was the patron god. With him went his followers, the Nymphs, Satyrs, and other male demons. Crowned with ivy leaves and dressed in deerskins, they carried in their hands the Thyrsos - bamboo sticks (kalamia) wrapped with ivy (kissos) leaves and tipped with a pinecone (konos koukounarias). They also carried burning torches and played panpipes (siriga) and tambourines (tibana), shouting "Evi Evan". After they had travelled to Egypt, Syria, West Asia Minor, Lidia & Frigia, they returned to Greece and back to Thebes where Dionysos founded his festivals and "mysteries". He was born twice (firstly, from his mother Semele and later from Zeus, his father's thigh). His mother was a mortal and his father a god, so he was half-man, half-god. He was not strictly immortal. Besides Dimitra, he was the only Greek god to inspire a "mystery" cult. 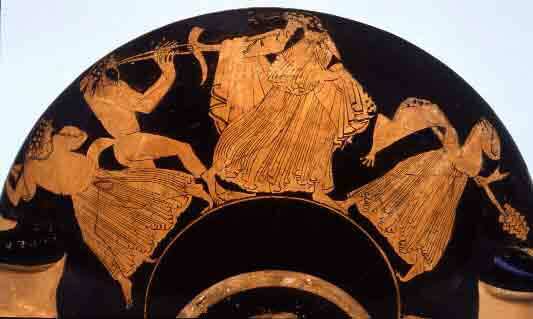 He is the patron deity of the Maenads (or Bacchantes), those wild women who roamed the lofty peaks shouting "Evi Evi". Dionysos, Dionysus, Bacchus, Bakchos, Bacchius, Acratophorus, Antheus, Aroeus, Colonatas, Leucyanites, Mesateus, Phallen, Psilax, Liber (Roman). Hence, references to "Bacchanalian revels" meaning wild parties! The god Dionysos is in some respects a relative latecomer to the Greek pantheon, at least as far as Olympus is concerned. For he does not make a real showing in the oldest works of Greek literature. 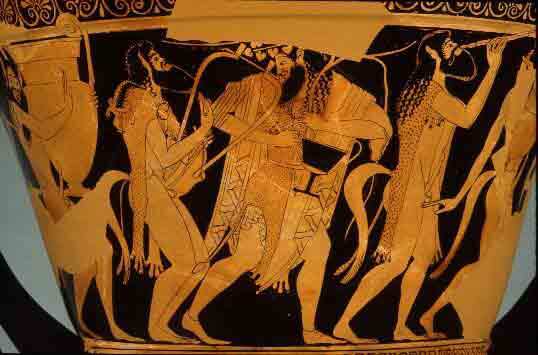 The Iliad of Homer contains only a brief glimpse of Dionysos, while he is almost completely ignored in the Odyssey. However, he did manage to become an important deity in his own right. "Be favourable, O Insewn, Inspirer of frenzied women!" Note the term "Insewn" used in reference to the baby Dionysos being sewn into the thigh of Zeus. Also, note the reference to the Maenads. Pirates who think he is a human prince who can be held for ransom abduct Dionysos. But his bonds and shackles just fall away and he stands there smiling mysteriously. The helmsman shouts to his fellows "We have a god in our midst!" but they do not heed him and set sail. Then a series of miraculous events occur. First, the ship was filled with wine, next the ship sprouted vines heavy with grapes and then he transformed himself into a lion and attacked the captain. The crew jumped overboard and were turned into dolphins. Only the helmsman who had recognized Dionysos was spared. Here you can see a pinecone-tipped Thyrsos being carried. 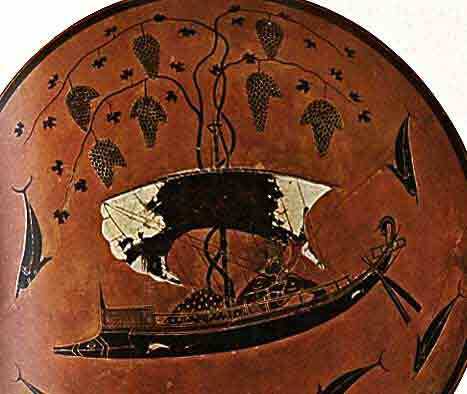 Here's that Nautical Legend about Dionysos with the grapevine sprouting inside the ship and the crew turned into dolphins. The women up in front seems to be having difficulty keeping her hands to herself! 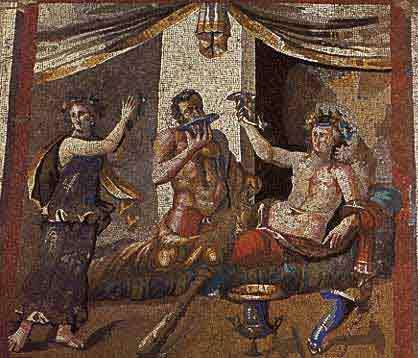 Note the huge glass of wine floating in front of Dionysos. 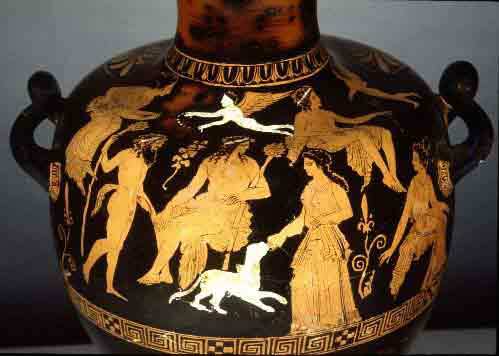 Here you can see a pinecone-tipped Thyrsos being held by Dionysos .... with revellers & dog in attendance. 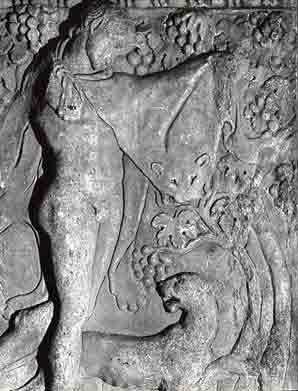 Stone relief of the young god in his grapevine-filled cave holding animal pelt. Lots of revellers in action in this picture! Again, note the Thyrsos. 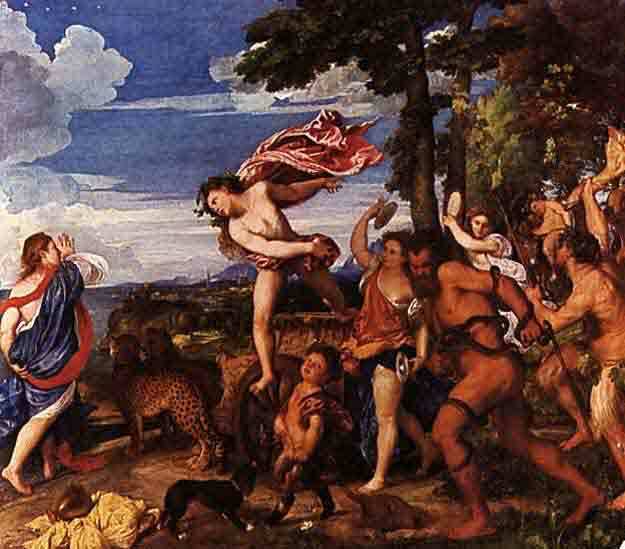 NOTES: This is Titian's famous Bacchus And Ariadne painted for the Duke of Ferrara (for his study, along with four other major works on mythological themes) - and is one of the most exuberant achievements of the high Renaissance. 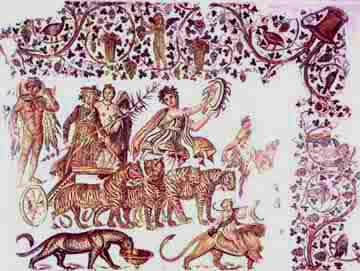 It is unforgettable; the gemlike azure of the sky has an extraordinary depth and, below, a wild procession as Bacchus (Roman name for Dionysos) hurls himself, drapery flying, from his chariot over the heads of two sedate cheetahs towards his frightened lover, Ariadne. The wild but immensely grand revellers behind him are the unmistakable attendants of a god. Titian is a painter who must be seen in the flesh; reproductions give a false impression of his style & the texture of his paint. ...... National Gallery, London, England. Note the young reveller leading the procession playing a tambourine.